As a blogger, spokesperson, adviser, community organizer, and university chaplain, Greg Epstein has served the country’s rapidly growing population of nonreligious people for nearly two decades. 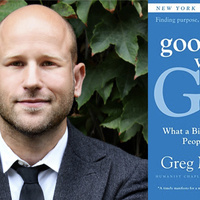 The author of the New York Times best-seller and landmark secular humanist book, Good Without God, will join us at our Fall kickoff social to speak about his secular moral ideals, and his vision for his new role as MIT’s first humanist chaplain. Free refreshments served at start, audience Q&A after talk, ice cream social follows. Free entry. The event will be photographed and recorded.